In early January, 1968, a small group of Americans decked out in military-type attire, though without any patches or insignia that would attach them to a particular unit, were preparing for the worst. Intelligence reports determined that Lima Site 85 (LS-85), their humble commune, nestled into Phou Pha Thi mountain’s summit in the Royal Kingdom of Laos bordering Vietnam, was more than likely about to be the subject of a massive assault by North Vietnamese troops who were already edging their way into the area. LS-85 was actually a clandestine command and surveillance center, run by a joint team of Central Intelligence Agency field operatives and US Air Force technicians. In two years leading up to the battle of LS-85, the CIA established the site as a base to organize and stage covert and special operations missions against the North Vietnamese Army (NVA) and their supply lines to derail their war machine. Hmong “Secret Army” militiamen were set up on and around the mountain as a line of defense, though against the onslaught of a numerically superior NVA contingent, they likely wouldn’t hold for very long. And word in the jungle was that the North Vietnamese Army had wised up to the mountaintop outpost’s existence. Given LS-85’s remote location, the best way to hit the site was by way of air. So, to that end, Vietnam People’s Air Force (VPAF) generals ordered to the air a flight of four Antonov An-2 Colts, crudely refitted to attack ground targets with bombs and mounted rockets pods. On the afternoon of the 12th of January, a team of spotters got word back to LS-85 that there were four aircraft inbound, and that the CIA agents and Air Force personnel, disguised as Lockheed contractors, needed to brace for the attack that would soon come. The rumblings of the clunky Colts grew louder, and a pair of An-2s broke away from the main flight. The remaining two circled over LS-85, and within a matter of seconds, small explosions peppered the site, with shrapnel ripping into the prefabricated trailers housing the sleeping quarters and the communications gear used to relay intelligence to other command centers, and to direct troops in the field. The tactical air navigation system (TACAN), positioned at the edge of the site, was similarly hit. Mortar shells, the VPAF’s primary weapon of choice in the attack, were dropped by crew through holes cut into the underside of their airplanes. Some failed to detonate, while others punched craters into the mountainside, lighting ablaze foliage and severely damaging any structures they blew up near. Pods on the wings of the Colts roared as they spewed forth their thin 57mm rockets during attack runs. Crossing back and forth over LS-85, the VPAF gave the guys on the ground hell, but the CIA and Air Force personnel at the site didn’t sit idly by or cower away… they gave them hell right back. Armed only with M-16s, M1911 pistols and fragmentation grenades, the operatives at LS-85 were now in the fight of their lives. Meanwhile, hope arrived in the form of an Air America UH-1D Huey, piloted by Ted Moore and crewed by Glen Woods in the rear. Having been alerted to the attack via radio, Moore immediately twisted the Huey in the direction of one of the Colts, which was now fleeing back to the North Vietnamese border. Though his helo was unarmed, Woods in the rear had an AK-47 rifle available for self defense. Grabbing it and hurrying to the open door, he readied his gun while Moore brought the Huey above the Colt. Woods, having sighted his quarry, let loose a burst of fire. On and off for twenty minutes or so, Moore and Woods gave chase to the Colt, periodically riddling it with lead whenever it came in to Woods’ sight picture. Just then, the second An-2 appeared underneath the Huey, which was apparently fast enough to beat out both the Colts in terms of speed. The first Colt, the subject of Moore and Woods’ efforts, finally departed from controlled fight and flew into a ridge directly west of the border. Not too long afterward, the other Colt streaked into a mountainside. 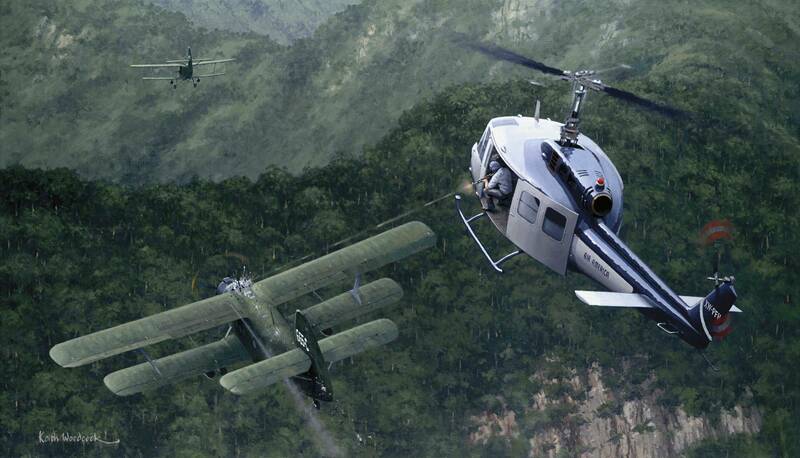 The other two Colts fled, while Moore put the Huey back on course to get to LS-85’s landing zone on Phou Pha Thi mountain. The field operatives at the site dispatched a set of teams to reconnoiter the crash sites for any signs of life, and upon reaching, they called a report in, stating clearly that both Colts were full of bullet holes. As it turns out, Moore and Woods had just performed the first and only helicopter-on-fixed-wing air-to-air kill of the entire war in Vietnam. Years later, in 2007, Moore and Woods would receive official recognition for their heroism and incredible airmanship during their service with Air America and the Central Intelligence Agency. A painting of Woods firing at one of the Colts during the Huey’s pursuit. This particular painting, completed by Keith Woodcock, hangs in a place of honor at the Central Intelligence Agency’s headquarters in Langley, Virginia.